Former Congresswoman and convicted felon Corrine Brown will have her sentencing hearing today in federal court after being convicted on 18 counts of federal fraud and corruption in May. *Editor's note: This story was originally published back on November 16, 2017. JACKSONVILLE, Fla. – Former Jacksonville area Congresswoman Corrine Brown took the stand Thursday afternoon, pleading for mercy from federal judge Timothy Corrigan. "I am sorry you have to be here today to see me in this situation," Brown said in her statement to the court. "I never imagined I would one day be in court asking people to speak on my behalf – never. In hindsight, I wished I had been more diligent in overseeing my personal and professional life The idea that some people could believe these charges hurt me because it runs contrary to everything I’ve ever believed and done in my life. I hope and pray these proceedings to don’t make them [ordinary people] lose faith in the system. I humbly ask for mercy and compassion." Brown was convicted on 18 counts of fraud and corruption in May. The lead prosecutor in the sentencing hearing argued Thursday that the former congresswoman should be sentenced to about 7.5 to 9 years in federal prison. Her defense attorney is seeking probation and community service. Prsecutor Tysen Duva told the court based on her actions during the investigation and in the trial, she should receive the most prison time out of the three co-conspirators. Brown wore a magenta suit to the courthouse Thursday and briefly appeared in the overflow courtroom prior to the sentencing hearing. Brown’s defense attorney James Smith objected to various aspects of the sentencing recommendations, including how much money Brown should be culpable for. Prosecutor Duva asked the court, “What accountability does the law require?” during his presentation. Duva said Brown was accustomed to receiving money she should not have received. She also lied about donations to colleges, churches and other entities. He also argued that Brown has made ludicrous comments during the investigation, including a comment where she essentially said that had investigators not been looking into her case, the Pulse shooting in Orlando would never have happened. She also referred to the charges as “bogus” and “racist,” implying that she was targeted for her race in the case. She attacked numerous agencies during the investigation, which Duva states shows her character as a person. “Why do you support someone who says this nonsense?” Duva questioned the court Thursday, referring to the upcoming character witnesses set to speak. Duva claims Brown “failed miserably” at being transparent during her time in office as a congresswoman. “This is systemic and this is who she became,” said Duva, arguing the character witnesses cannot overshadow the conduct she performed in the criminal case. “It’s not something that should be present in American democracy,” he said. Duva said the judge has to make a difficult decision in this case. Brown has previously asked for delays in her sentencing due to storm damage to her home and mental and physical welfare checks, but all those motions were denied. On Wednesday, prosecutors recommended reduced prison time sentences for Brown’s co-conspirators, former chief of staff Ronnie Simmons and fake charity founder Carla Wiley. Judge Tim Corrigan accepted this recommendation for a reduced prison time range of 21-27 months for Wiley and 33-41 months of Simmons. More on that hearing can be read here. Brown, Simmons and Wiley will not receive their final sentencing until Dec. 4, according to recent court documents. Corrine Brown had several witnesses come forward Thursday in support of her through witness testimony during the sentencing hearing. Congresswoman Sheila Jackson Lee provided a glowing character witness of Corrine Brown during her sentencing hearing Thursday. The veterans’ community loved Congresswoman Brown, Jackson Lee said, stating that Brown has helped those with PTSD and other issues following fighting overseas. She also stated Brown helped tremendously with relief efforts during Hurricane Katrina in New Orleans. “That shows a character of giving to others unselfishly,” Jackson Lee said. One woman who went to school with Brown’s daughter got emotional during her testimony in support of Brown. She said Brown taught her valuable lessons that helped her thrive in her military career and how to treat her soldiers. “She’s been my champion .. my mentor,” the woman said. Dr. Oliver Hunter of Houston recommended that Brown receive community service instead of incarceration time. Melissa Alexander came forward to speak on behalf of Brown, describing her as a “blunt and passionate” woman. She cited that she’s been supportive of other people even up to the sentencing hearing. One man came forward and said Brown has helped other garner jobs through projects she’s worked on in Jacksonville and other areas. He beseeched the judge to “embrace her through your mercy” and not give her any prison time. Roselyn, a life-long friend from Brooklyn, New York, came forward to provide her insight into who Brown is as a person. She said Brown is a passionate and hard-working woman who has long been a beacon of support for those in need of help. After lunch, political consultant David Muller shared testimony on Brown, implying that she’s a genuine, caring person. He also discussed a time where Brown called him up and asked for help getting a train, so that she could get supplies to Haiti following an earthquake. She had 18 tractor trailers full of supplies and moved them via a cruise ship to Haiti, Muller said. Many in the court clapped following Muller’s testimony about Brown. 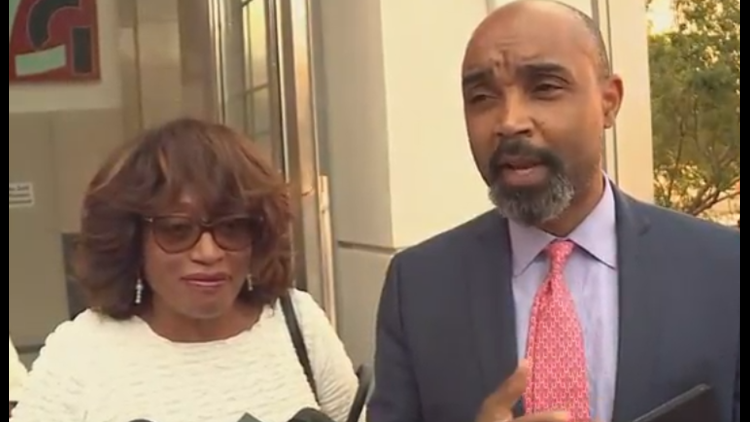 Former Congresswoman Corrine Brown issued a statement during the sentencing hearing Thursday, apologizing to the court, her family, friends and supporters. She said the charges against her are not who she is. The defense attorney belabored the point that they are against the notion that Brown abused a position of trust, which is established by the evidence presented in the trial. The judge wasn’t so sure and asked the defense attorney to elaborate. He attributes some of her actions to the progress our country has made in terms of relations for black people. Smith said he met with an Orlando attorney who was from Jacksonville and said the attorney described Brown as “our Martin Luther King” for black Jacksonville natives. Smith said “extensive rigorous community service” would be much more appropriate for Brown than going off to federal prison for five years. Restitution is also not conducive to prison time, Smith argued. The judge will also be accepting additional letters in support of Brown. Court recessed at about 2:40 p.m. Thursday. The final sentencing will take place on Monday, Dec. 4 at 10 a.m. Following the recess, Smith briefly spoke with media regarding the atmosphere in the courtroom, confirming that it was at some points emotional for him because he's gotten a chance to know Brown over the year-plus they've been working together. He stated some of the emotions just show that he's only human. There are a lot of moving parts in the case against Corrine Brown and her co-conspirators. Carla Wiley first became involved in the fraud scheme when she started dating Ronnie Simmons. Carla Wiley, President of the now-defunct fake charity One Door for Education. She pleaded guilty last March to wire fraud, and agreed to testify against Brown. She was president of a charity called One Door for Education, which was never actually registered as a 501(c)(3). The fake charity received more than $800,000 in four years, with about only $1,200 of it actually going to scholarships for students. That money is now gone. Simmons was dating Wiley when he told her he needed a nonprofit to financially back a reception for congresswoman Brown in 2012. Wiley offered One Door for Education as an option for that reception. The charity claimed to give scholarships to poor and underprivileged children seeking the become teachers. During the initial trial earlier this year, Brown’s defense attorney, James Smith, described her as a hardworking congresswoman who was dedicated to her constituents. Lead prosecutor A. Tysen Duva argued during the trial that Ronnie Simmons worked under Brown and did her bidding by taking out $800 a day from the One Door for Education bank account and depositing it into Brown’s personal bank account. He did this numerous times, according to Duva and evidence released earlier this month. The fake charity was essentially used as a slush fund for Corrine Brown’s travels, expenses and shopping, according to the prosecutors. She used the money put in her bank account to go to Nassau, Bahamas with her daughter, fly to Beverly Hills and shop along Rodeo Drive, and attend a Beyoncé concert, according to court documents and previous reports by First Coast News. The prosecutors also argued that Brown committed wire fraud, mail fraud and stole money from the government after she lied on tax documents. Brown had friends in high places, such as former CSX CEO Mike Ward. She would ask them for donation to Open Door for Education and many of them gladly donated, according to previous reports and prosecutor testimony. Ward, for instance, contributed $35,000 to One Door for Education after learning that the money would go toward providing students with iPads for learning. Prosecutors also argued that Brown lied about and inflated what she gave in tithes to various churches. The churches came forward in the trial and said the donations claimed to be given by Brown did not match their records, to which Brown said she sometimes gave anonymous donations. Other legitimate scholarship organizations came forward and said they had never received funds from Brown’s charity. Meanwhile, Brown’s tax returns claimed she contributed as much as $30,000 – 20 percent to a third of her income, to various charities. Prosecutors also claimed that without the cash deposits that Ronnie Simmons made to her bank account, she would have overdrawn her account numerous times during 2012 to 2015. When Brown took the stand, she denied any wrongdoing on her part and said she trusted the wrong people and said they were behind the unlawful acts. She cried multiple times on the stand and said she was not to blame for what had happened, according to previous reports. Overall, the prosecution argued that $330,000 of the money garnered through One Door for Education was used for events receptions surrounding the congresswoman. Meanwhile, $70,000 of that money went to cash in the congresswoman’s pocket. Carla Wiley pocked more than $100,000, while Simmons is accused of pocketing thousands of thousands of dollars for himself.